"Mr. Angel’s Egyptian collar necklace creations are reminiscent of ancient artifacts while maintaining a timeless sense of design that render them contemporary and wearable. Mr. Angel, the artist, from discerning choices of superior semi-precious stones and vermeil findings, beautifully assembles all of the components with the utmost care. Arts and Exhibitions, Inc. is thrilled to include the artistry of designer Skip Angel in our Premiere Museum Store jewelry assortment for the historic exhibition Tutankhamun and the Golden Age of the Pharaohs." A.Q.A. Designs collection of vemeil, turquoise, lapis and carnelian King Tut jewelry has traveled with the King Tutankhamen Exhibition (King Tut) to most metropolitan museums, from The Los Angles Museum, Fort Lauderdale Museum, Chicago Museum, Philadelphia Museum, British Museum, Atlanta Museum, Houston Museum and now to San Francisco. His works have also been sold at The Portland Art Museum's The Quest for Immortality Exhibit. In addition, Mr. Angel has a line of Asian inspired jewelry sold mostly in boutiques. Ambrosio's interest in rocks and gemstones began at the early age of ten when he started collecting rocks and proudly displaying them in the backyard. Noticing his keen interest, Ambrosio's mother took him to a San Francisco gem and mineral show where he was delighted to learn how a rough stone is transformed into a finished piece of jewelry. His high school arts and crafts teacher also noted that his creativity with jewelry was well above high school level and encouraged him to further develop that talent. She said, "You have a creative mind, you cannot learn to be a creator, it's something that you’re born with." In college Ambrosio focused mainly on advanced jewelry making, as well as art and architecture. Recognizing his son's natural talent, Ambrosio's father traveled with him to Thailand, the source of fine gems, so Ambrosio could experience first-hand the process of transforming raw stones into finished gems. After his formal education, Ambrosio worked in Macy’s Fine Jewelry Department and then at San Francisco's Galleria and Showplace Design Center as a rug and furniture designer. Knowing his passion for jewelry only as a hobby, his family and friends continued to encourage him to make it a business. The inspiration for his first line of Egyptian jewelry resulted from viewing Cleopatra movies. A visit to the Tutankhamun and the Golden Age of the Pharaohs exhibit at the Los Angeles County Museum of Art further inspired him as he noticed the gift shop did not carry any jewelry in the style of that worn by ancient Egypt's royalty. 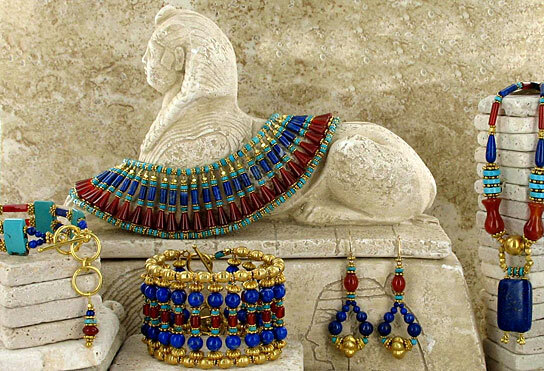 But he just happened to have a photo of his niece wearing an impressive turquoise, lapis and carnelian collar, stones the exact colors used in Egyptian jewelry! Upon viewing the photo the manager asked, “Do you have any more?" ...And rest is history! Anita Angel’s artwork has a magical quality which invites the viewer into her paintings. Her seascapes, with translucent waves undulating on the sandy shores of the California coast, are rich in color and show the action of the waves and spectacular skies. Numerous paintings of Italian architecture and landscapes have influenced Anita’s style, as reflected in her paintings of California vineyards that rival any scene in Tuscany. Inspired by European old-world masters, her still-life paintings have the dramatic lighting and rich hues reminiscent of Dutch painters who captured the essence of their times on canvas. She enjoys a versatility of subject matter from people to places and has a dramatic flair in the quality of her work. Those who are interested in inmotion hosting have already tried unlimited and are more than satisfied. Ruby on Rails is a preferred framework for web application development these days. This is due to the flexibility and the rapid application development capabilities that the framework provides. A good Ruby on Rails Outsourcing Partner knows rapid application development extremely well. Such a Service provider is likely to build a TDD/BDD driven solution rapidly on top of Ruby on Rails. A graduate of the California State University, Anita successfully traverses the professional business world and the personally fulfilling world of art. She is a member of many art societies and is recognized as an accomplished and popular artist.